Nasa's robot rover Opportunity has found round grains in the soil of Mars, raising the possibility they may have been shaped by liquid water. Photos taken by the rover's microscopic imager show coarse soil grains of different shapes, including round ones. But few of the grains are spherical, which means other forces could be responsible for their shape. Scientists say meteorite collisions could have produced rounded grains by melting the Martian rock on impact. "We saw a bunch of really fine-grained stuff that we couldn't tell much about and then we saw these coarser grains on top," said US space agency (Nasa) principal investigator Steve Squyres, describing the soil's structure. "We began to notice that some of these grains looked awfully darn round." Mission scientist Hap McSween said there was a limited number of ways very round grains could have formed. One possibility was that grains in moving water had accumulated layers of material on their outside as they rolled around. These near-spherical grains are known as oolites. 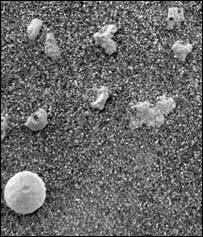 But the microscopic imager revealed that very few of the particles were spherical balls. This meant that the moderately rounded grains are unlikely to be oolites. "Oolites also shouldn't have these little bubbles in them." One explanation, he said, was that large impacting meteoroids could have melted Martian rocks, spraying the resulting molten material out as a fine jet which cooled to form a glass. If the original Martian rock had water in it at the time of the impacts, gas could have formed in the molten material, which might explain the small holes or bubbles in the grains. "These droplets, as they fly through the air, develop aerodynamic shapes - intriguing shapes like dumbells and teardrops, sometimes buttons. And I think I've seen all three of those shapes while looking at the [microscopic imager]," Dr McSween added. Another possibility is that round grains in the soil are lapilli: ash particles from a volcanic eruption that coagulate to form small, rounded pellets. The scientists released a mineral map of part of Opportunity's crater, which was produced using data from the Miniature Thermal Emission Spectrometer (Mini-Tes). It shows that the grey mineral haematite, which sometimes forms in the presence of water, is most concentrated near the rim of the crater. Scientists also took measurements of the soil using the rover's Moessbauer spectrometer. It confirms the presence of a magnetic compound which could be haematite. Opportunity's twin rover Spirit is recovering gradually from its malfunction on 22 January. Dr Mark Adler, deputy mission manager for Spirit, said attempts to provide the rover with its bearings by getting it to look at the Sun had failed. This could be remedied by re-formatting its flash memory, thought to be the source of the problem that crippled it.